Sometime between late last night and early this morning, we experienced the end of autumn, and the beginning of Winter – the Winter Solstice. This moment is celebrated by many faith traditions and cultures across the world. 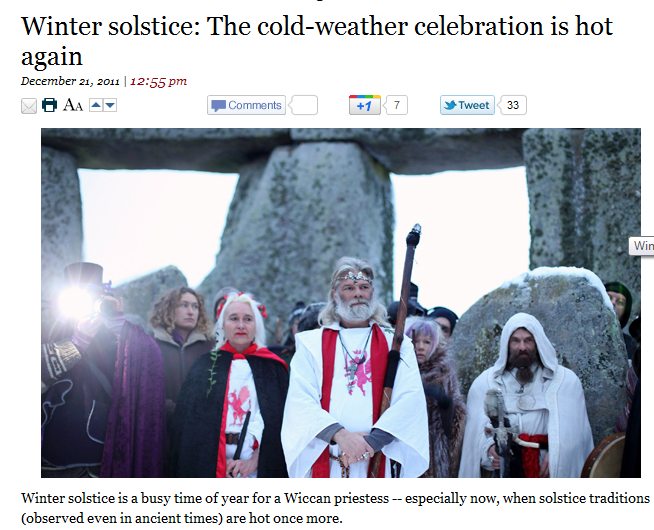 The Los Angeles Times reports on a new wave of interest in celebrating the Winter Solstice, which has been celebrated for centuries. Read about how it’s “cool to celebrate Yule” again, and what that means for a Wiccan priestess, Selena Fox, in Los Angeles. Selena Fox is also the founder of The Circle Sanctuary, a Wiccan church and nature preserve in Wisconsin.